Good morning! I just loved this cute little "big-headed" birdie! Everytime I look at her, I laugh -- to me it looks like she's telling someone off.. or in this case, she's saying Hello. I used Amy's Friday sketch, AMYRS63. Accessories: Circle Nestabilities (Spellbinders), Cuttlebug (Provo Craft), Markers (Copic), cornice border punch (Martha Stewart), ribbon, rhinestones, foam tape. This is really cute, Stephanie! I just love the colors that you used! It's so cool how many different cards come out of one sketch! 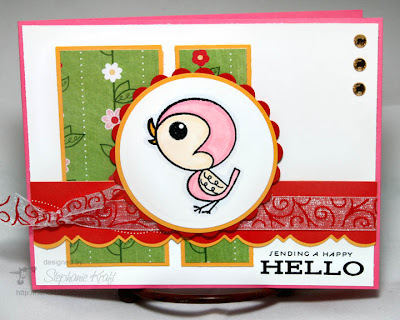 This is such a cute card, that little bird is too cute! This bird is too cute!